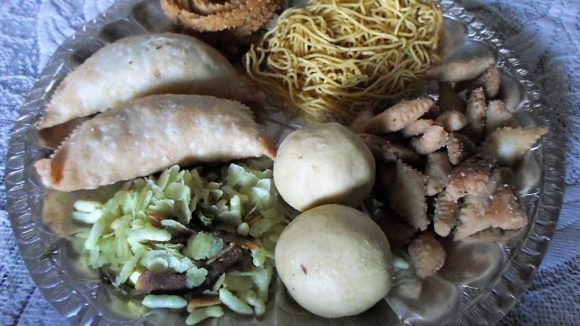 This is a Recipe for a Chinese starter, prepared in the Indian style of cooking. 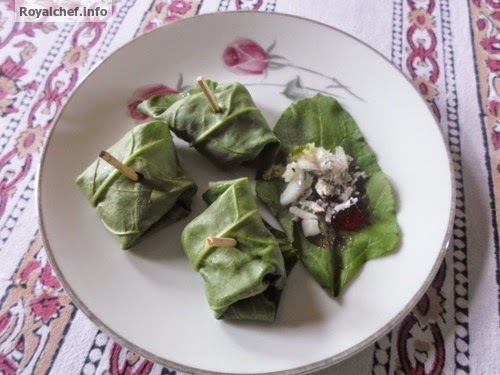 This is a kind of Chinese Paan, the Chinese version of the common Indian Betel Nut Paan preparation. This Chinese Paan, which is known as Meyang in the Chinese language serves as a unique and most uncommon snack for all kinds of parties, including cocktail and kitty parties. Clean, wash and wipe the Spinach leaf. Mix the dry grated Coconut, Sugar powder, Green Chili, Lemon pieces, Ginger piece and prepare the mixture. Apply the Jam over the Spinach Leaf and then add the mixture and fold the leaf then serve.